We’ll be discussing this in Brussels! Six years of massive demonstrations, with hundreds of thousands of citizens taking part, are the real proof of the enormous size and scope of the Catalan sovereignty movement, a massive and persistent democratic phenomenon, unprecedented in Europe. Ever since the first demonstration in July 2010, provoked by the judgment of the Constitutional Court against the Statute of Autonomy, which had been previously approved by referendum, the social base in favour of the right of the people of Catalonia to decide their future has continued to grow in size and strength. The political expression of this trend is reflected in a parliamentary majority, as a result of the last Catalan elections in September 2015, with a participation of 75%. 72 Catalan MPs were elected with an electoral programme in favour of independence and a further 11 in favour of holding a referendum on self-determination, without advocating “yes” or “no.” So there are 83 MPs from a total of 135 (61.5%) who have the democratic mandate to resolve the conflict over the political status of Catalonia through the ballot box, as was the case in the UK with Scotland. However, all attempts to discuss this with the Spanish government have been in vain. Harsh judicial procedures against political representatives in favour of sovereignty is the only response obtained so far. The intention of the Catalan government is to agree the terms of the referendum with the Spanish government: the date, the question, plus the management of the results. If, in spite of this, an agreement cannot be reached, the commitment to the Catalan people is to go ahead with this consultation, with full juridic effect. What has caused such a long term mobilisation of such a broad segment of Catalan citizens? Why does the Spanish state refuse to start talks on the issue? What political and social scenarios are possible if the Spanish government will not agree to a vote and coercively prevents the voting of Catalan citizens? What impact could the Catalan sovereignty process have on the refounding of Europe? 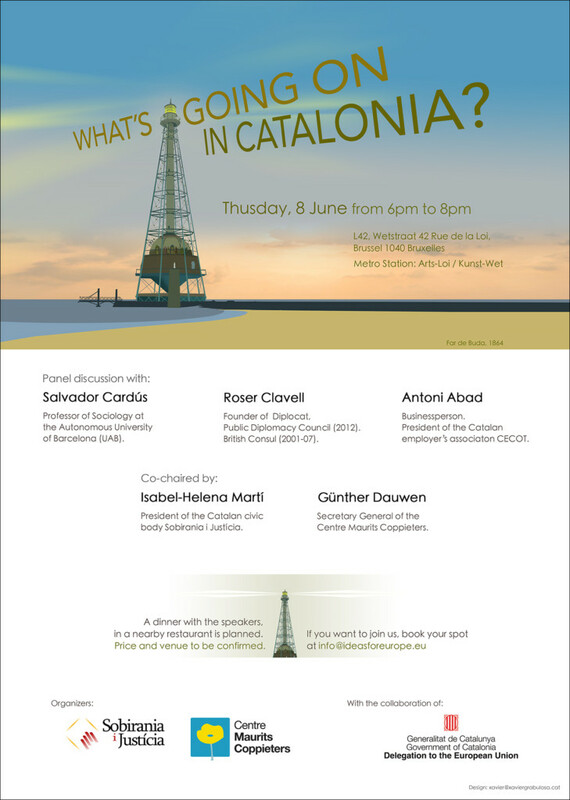 These are some of the key questions to understand what is happening in Catalonia and which the organisers, Isabel-Helena Martí, president of the civic body Sobirania i Justícia (Sovereignty and Justice) and Günter Dauwen, secretary general of the think-tank Centre Maurits Coppieters will try to address and discuss in the second edition of What’s going on in Catalonia? 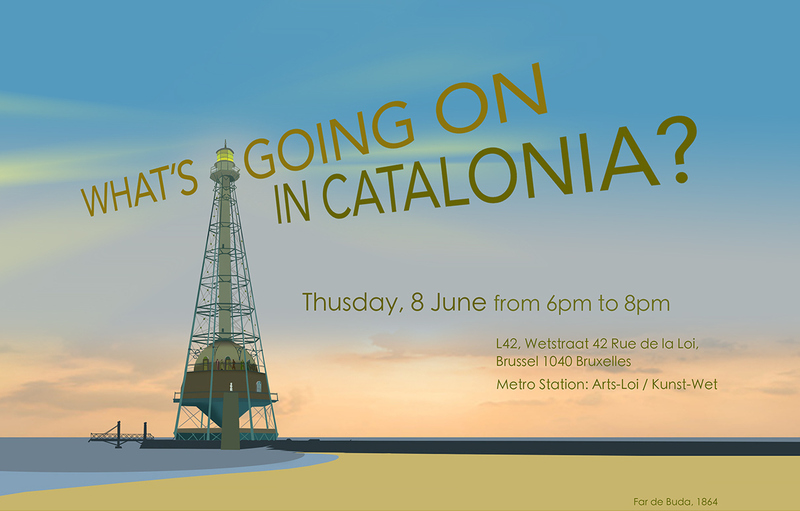 which will take place on Thursday 8 June in Brussels. The organisers will provide tea and coffee at 17:00h in the same space Live in L42 for those who want to arrive early and do some networking with speakers and attendees. After the event we will have dinner together at a nearby restaurant and this is open to anyone who wishes to join us. IMPORTANT: Please be aware of the essential security measures in place at the moment. Remember to bring identification with a photo and full name in order to register on the day. Otherwise, it will be impossible to access the room.